Snowball Finance (Xueqiu in Chinese), the Chinese financial social media, announced that the company has raised US$40 million in Series C funding led by Renren Inc. and joined by existing investor MorningSide Ventures. 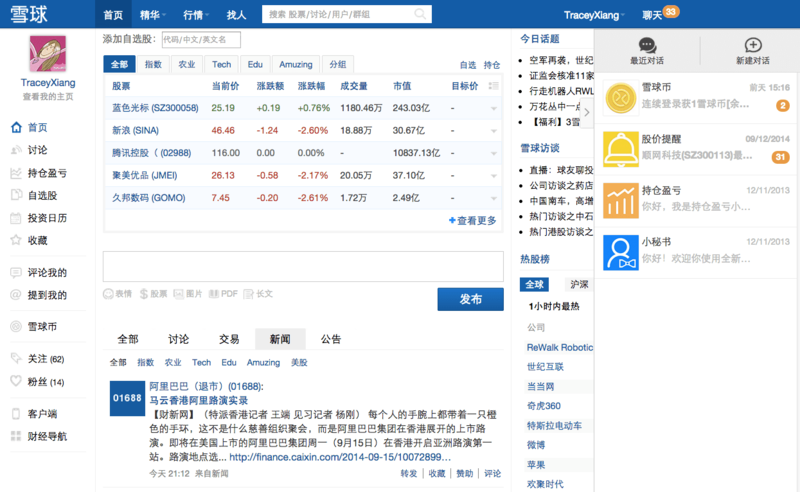 Xueqiu.com is now one of the most popular financial social networks among Chinese investors in China. The company raised Series B funding of US$10 million last year and US$3.2 million in Series A in 2011. Renren, the notorious Facebook copy, doesn’t turn out to be successful in China even though Facebook hasn’t been accessible here. The company reported 42% year-over-year decrease in total revenue in Q2 2014. Gaming, which used to be the only profitable business of the company, began declining from the second quarter of last year and decreased 57% year-over-year in the second quarter of this year. But Joseph Chen, CEO of Renren Inc., has become a well-known investor as Renren has recorded large gains from investments in some Chinese tech companies, such as eLong and VIPShop. The company recorded a one-time gain of US$50.9 million from the sale of the stake in eLong in the first quarter of 2013. That was one of the few quarters the company turned a profit.